I'm not entirely sure what I did, but I managed to hurt my back this past week. It was bad enough I had to call out of a sub job at one of my favorite schools and I made an appointment to see a chiropractor. The good news is today, I can walk without pain! And for the first time in longer than I care to admit, I actually made a fairly decent meal for the family. I'd been pawning off the cooking to D, one of the kids, or throwing chicken in the oven with a bit of salt and pepper. Very much zzzzz meals. 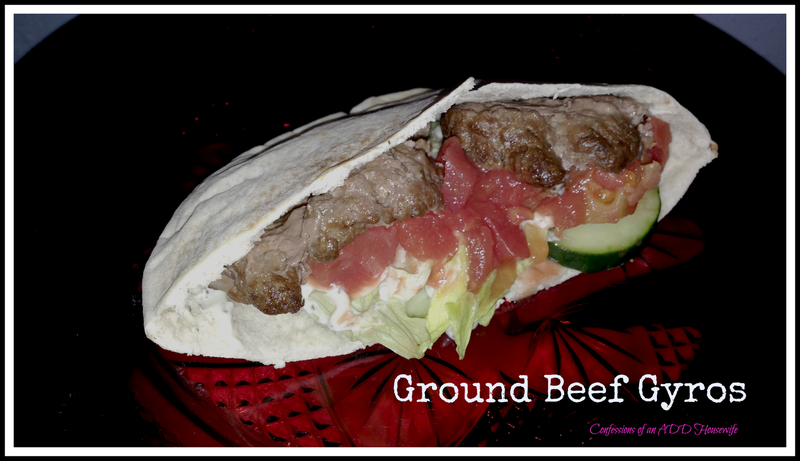 This recipe is one of my standby ground beef recipes. It goes together quick and has plenty of vegetables in it...and the kids gobble it all up. Honestly, this is a "cheater" recipe in that I take some liberties with the sauce. It's not authentic, but it's definitely tasty. Line a rimmed cookie sheet with tin foil. In a small bowl, mix together ground beef and seasonings. Shape in to four patties. Place on lined cookie sheet. Broil, about 4 inches from heat for about 7 minutes on each side. Cut the patties in to slices. Fill pita with sliced meat, yogurt dip, cucumber, lettuce and tomato.